“Increasing numbers of young adults are fortunate enough to have the opportunity to experience a gap year between school and further studies. When our youngest daughter Zantel turned 18 in grade 12, the gap year was a great opportunity to create a needed break. 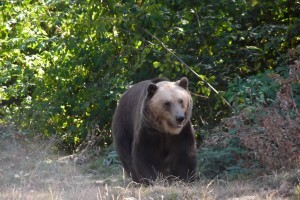 As part of her gap year, she decided to spend one month in Romania at the Bear Sanctuary in Braşov. She did the research and confirmed that she wanted to go with Oyster Worldwide. She made contact with Anne at the UK office, who immediately created a personal working relation with Zantel via mail and a Skype video conference. Oyster was most flexible with the payments and assisted with VISA information. The price tag for the month was not cheap, but was reasonable. Link that, to the dissonance any parent might have sending their youngest 10 000km away on an adventure trip, perhaps need more bravery from the parents than for the kid. But the price tag proved to be great value for money. Zantel left mid-September 2011 from Cape Town in South Africa and she was welcomed with two other adventure seekers by Razvan (Oyster’s rep in Romania) at the airport in Bucharest. They travelled to Braşov where Razvan made them acquainted with the city, the sanctuary and the history of the town. Zantel enjoyed the time with the bears tremendously and it was all she has ever dreamt of. One day however she cut her thumb quite badly whilst opening a can. The thumb got infected to such a point that she needed to get medical attention. She was taken up in Braşov County hospital on the Thursday. She was treated in hospital until the Monday when the doctor stitched up her hand and released her from hospital. I did try to make a couple of calls to the hospital, but public hospitals are not hotels where the front desk speaks fluent English! I gave up after several calls and put all my faith in Razvan. Now one might think that with your child, 10 000km away in a foreign hospital, you would probably go out of your wits, but we went to bed every night with peace in our hearts. Razvan did a sterling job in organizing the hospital, regular communications to us and he was always available on mail and telephone. Razvan even assisted Zantel back to the airport in Bucharest on departure. He also assisted with customs since her VISA expired whilst in hospital. Later that afternoon Zantel arrived safely in Bosnia & Herzegovina to continue her gap year where she will be spending the winter with her older sister in Sarajevo. Zantel has many memories of Braşov, for all sorts of reasons. The hospital was not part of the script, but the support we received from Oyster Worldwide will always be part of the fond memories of Braşov, Romania and the Oyster team. A grateful family that will be able to endorse the Oysters of Oyster Worldwide at any time. Many thanks to Dewald le Grange for this kind letter about the gap year support offered on our Romania projects. We are only pleased to help, and delighted that Zantel had a fantastic trip.